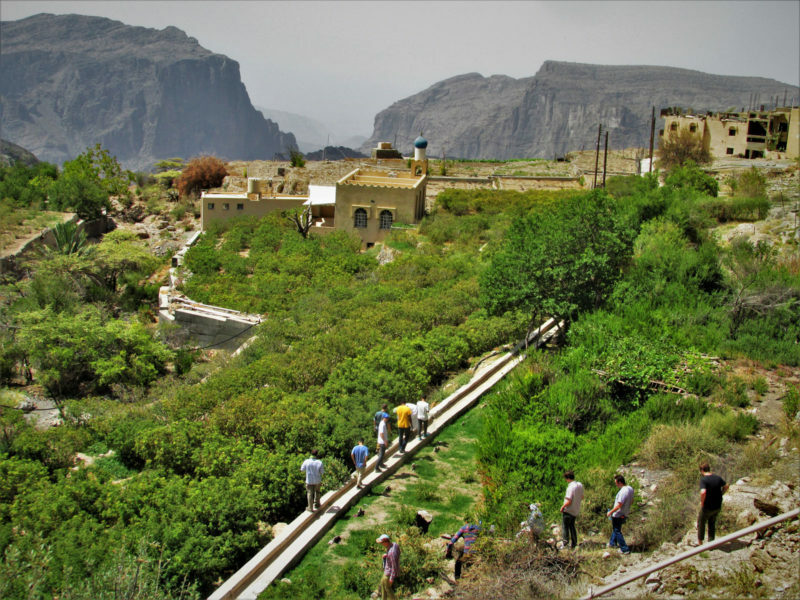 The course fee includes one larger two-day excursion outside of Ibri and another smaller one-day excursion to an Omani village with its farms and falajs (irrigation canals) near to Ibri. Who Provides The Course Materials? Noor Majan provides all course materials. They are included in the course fee. Our classes have a maximum of eight students per level. Noor Majan provides lunches at the institute on school days (Sundays through Thursdays). Students living with a host family will share the family’s meals. All other students are responsible for their breakfast and dinner during the week and for all meals on weekends except on excursions. The apartments are equipped with a stove, oven, microwave, water cooker and kitchen ware. Students take a weekly bus trip to the supermarket to stock up on groceries. Prices at the supermarket are similar to Europe while eating out or take away from small restaurants is rather cheap (2-5 OMR per meal). All students live in our student apartments. This type of accommodation is covered by the course fee. The apartments consist of shared two-, three- or four-bedroom apartments. Bedrooms are double occupancy. The fully equipped kitchen, lounge area, bathrooms, an automatic washing machine and flat screen TV are for shared usage within one apartment. All apartments are equipped with WiFi internet access. Bed linen is provided but you need to bring your own towels. Female students have the opportunity to live with Omani host families for the duration of their course. For this arrangement Noor Majan has to charge an additional 150 OMR/month. The family provides a bed, wardrobe, desk, and bed linen but you need to bring your own towels. Students will share the regular family meals. Noor Majan Training Institute applies for student visa for all of our students. These student visa cover the entire period of your stay with us as Noor Majan students. The student visa costs 30 OMR and has to be paid by the student. We need a scan of the participant’s valid passport and passport picture in order to apply for the visa. Once the visa is granted we’ll send a scan of the visa slip to the student who has to print it and present it to the immigration officer upon arrival at Muscat airport, where the actual visa is stamped into the passport. Student visas are non-extendable and multiple entry. Students entering from other border posts than Muscat airport, need to inform us ahead of time. Noor Majan provides transportation to and from the institute for classes for all its students as part of the language course. We also provide the bus for the weekly supermarket trip. All other outings need to be arranged individually. There is no system of public transportation in Ibri. The taxi station for trips inside and outside of Ibri is in proximity to the students’ dormitory and there is also a bus station for trips to other Omani towns and Dubai. A taxi trip inside Ibri costs around 300 – 500 bz per person, and a taxi trip to Muscat 5OMR per person in a shared taxi. If you rent a taxi on your own to Muscat/Burj Al Sahwa that will cost 20- 25 OMR regardless of the number of passengers. A bus trip to Muscat/Ruwi is 3.800 OMR. Noor Majan also provides airport transfer between Muscat International Airport and Ibri. On the day prior to the course start our driver will meet students in the arrival hall of Muscat International Airport (Ooredoo telecommunications stall) between 10:00 and 11:30 a.m. and the bus leaves to Ibri at 11:30 a.m. A bus or taxi will be arranged to take students back to the airport in the afternoon of the last course day. Students arriving in Muscat late at night will have to spend the night in a hotel in Muscat and meet the group in the morning at the airport. Students arriving after the meeting time will have to make their way to Ibri individually by taxi or bus and we’ll meet them at the station in Ibri. No cases of MERS have been reported from Oman so far, but we’d still recommend you keep a safety distance to unknown camels, especially as they may bite as well. Snakes and scorpions might be encountered in Oman, especially during outdoor trips to the desert or wadis. Their bites are painful and potentially harmful but all health centers and hospitals dispose of the necessary anti-venom for all varieties found in Oman. Please inform the administration immediately of any snake or scorpion bite incidents and we’ll take you to the hospital. Due to Ibri’s hot climate you’re likely to encounter some ants and spiders as well as the occasional cockroach. Our janitor is responsible for cleaning the floors of shared spaces in the apartments once a week but apart from that the apartments’ cleanliness is the students’ responsibility. Especially the dustbins/garbage should be emptied in a timely manner to avoid bad smells and insect infestations. Men should wear long pants at all times. Sleeveless shirts or transparent fabrics worn without undershirts are not acceptable. Shirts should be long enough to cover the small of your back, even while sitting, preferably longer. Women should wear loose-fitting long and opaque pants or skirts at all times. Shirt sleeves should be 3/4 length or long sleeves. Shirts should be long enough to cover the small of your back, even while sitting, or preferably longer. Winters (November – February) in Ibri are mild with temperatures around 20-25°C. Lowest temperatures in winter will be around 10°C at night. Summers (June – August) are hottest with average temperatures around 45°C. It can get as hot as 50°C during the summer months. Rainfall is most likely to occur between February and April; after heavy rainfalls wadis may be flooded. What Voltage And Socket Types Are There? The institute and the student apartments are equipped with wireless internet access. We encourage students to bring along their own laptops as Noor Majan does not provide computers for students to use. We recommend purchasing an Omani SIM card upon your arrival in Oman. A SIM card is 2 OMR and contains 2 OMR credit already. You can call, text or WhatsApp us on +968 994 333 81 (Sultan Al Farsi) to inform us about your arrival in Oman. At the end of your course the administration will provide you with a course certificate stating the numbers of contact hours, the course level and your final result. These certificates have been recognized for credit by several US, UK and European universities as well as government bodies in the US, Germany, and Austria.